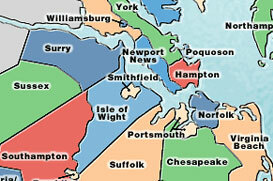 Hampton Roads is a very unique metropolitan area of the United States. Hampton Roads encompasses Real Estate in Virginia Beach, Real Estate in Norfolk, Real Estate in Chesapeake, Real Estate in Suffolk, Real Estate in Portsmouth, Real Estate in Hampton, Real Estate in Newport News, Real Estate in Williamsburg, Real Estate in Poquoson, Real Estate in Smithfield, Real Estate in Gloucester, and Real Estate in Jamestown. Hampton Roads is culturally very diverse, with the largest Naval Base in the world at NOB Norfolk Naval Base, and additional military posts at NAS Oceans, Fort Eustis, Fort Story, Langley AFB, and Amphibious Base Little Creek. In addition, the Hampton Roads area is a true treasure chest of American History, including Colonial Williamsburg and the Jamestown Settlement.